A first-two major American Heart Association awards go to one recipient: ex-AHA President Dr. Sidney C. Smith Jr.
NEW ORLEANS, Nov. 14, 2016 — For the first time, the American Heart Association (AHA) has presented two major awards to one recipient: long-time volunteer leader and former AHA President Sidney C. Smith Jr., M.D., of the University of North Carolina at Chapel Hill. 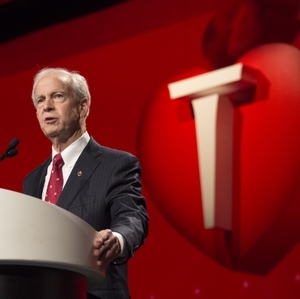 First, Smith received the James B. Herrick Award of the AHA Council on Clinical Cardiology, an annual honor saluting excellence in the advancement of cardiology practice. Ileana Pena, M.D., council chair, presented the award, a citation and medallion, at a Saturday, Nov. 12, council dinner meeting in New Orleans. Then, on Sunday, Nov. 13, Smith received the Chairman’s Award, a tribute to outstanding volunteer service on behalf of the AHA. The award was presented during the opening of the American Heart Association Scientific Sessions 2016 at the New Orleans Ernest N. Morial Convention Center. Association Board Chairman Alvin L. Royse of Hillsborough, Calif., presented the award, a citation and $1,000 honorarium. This service included three years as President-Elect, 1994-95; President, 1995-96; and Immediate Past President, 1996-97. Smith was a member of the national Board of Directors, 1991-96, and was the Association’s Chief Science Officer, 2001-03. “In addition to his roles in science and medicine, Dr. Smith’s insightful leadership has benefitted AHA programs and activities in many other ways,” Royse said. “During Dr. Smith’s distinguished four-decades-long career, he has had a highly effective and sustained impact on cardiovascular disease prevention, diagnosis and treatment, including major roles steering the American Heart Association toward the fulfillment of its mission while having a direct, positive influence on cardiovascular medicine,” said Pina, of New York’s Albert Einstein College of Medicine. The citation continued: “Dr. 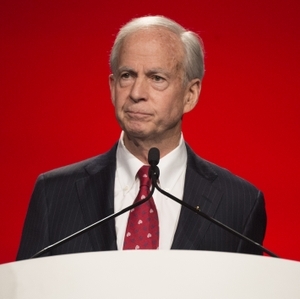 Smith’s prominent participation in the development of treatment guidelines by the AHA, the American College of Cardiology and the National Heart, Lung and Blood Institute has been remarkable, to the point of being legendary.” He served on the AHA/ACC Task Force on Practice Guidelines, 1997-2009. Smith currently is professor of medicine and past chief of the Division of Cardiology at the University of North Carolina at Chapel Hill. New Orleans, LA - AHA 2016 Scientific Sessions - Sidney Smith, Jr. accepts the Chairman's Award and the James B. Herrick Award of the AHA Council on Clinical Cardiology during the Opening Session, here today, Sunday November 13, 2016 at the American Heart Association's Scientific Sessions being held here at the Ernest Morial Convention Center. Scientific Sessions is the leading cardiovascular meeting for basic, translational, clinical and population science, in the United States, with more than 19,000 cardiovascular experts from over 105 countries attending the meeting.